"For you as a cruiser, there will be a few occasions when you might benefit from a Venice taxi ride!" In Venice, taxi (land taxi) might not be the most often used means of transportation. It cannot reach the most popular Venice attractions and it cannot compete with an "out of a movie" experience a water taxi can give you. However, for you as a cruiser, there will be a few occasions when you might benefit from a Venice cab ride. The furthest point that a land taxi in Venice can reach is Piazzale Roma. This is where cars, Venice land taxis and bus services stop and where water taxis, water buses (vaporettos) and gondolas take over on the way into Venice. Taking a land taxi from the Marco Polo airport to Venice is a practical solution if you're tight with time and you are boarding the cruise ship on the same day. Using a Venice taxi on land, you won't need to wait for the local buses, no need to lug your bags to the water bus or water taxi dock. And... you'll be dropped off right inside the Venice cruise terminal. If you are staying in Venice for a few days before your cruise and need to reach a hotel, first make sure you know the exact location of your hotel. Land taxi from the airport to Piazzale Roma will be helpful only if your hotel is near the Piazzale Roma. In case your hotel is closer to Rialto or San Marco area you will need to either continue your travel from Piazzale Roma in a water taxi or consider taking an Alilaguna airport transportation boat straight from the Venice airport. 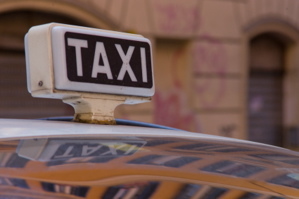 Taxi fares from Venice airport to both Venice cruise port and Piazzale Roma are about €30 - €40. If you are disembarking your cruise ship in Venice and rushing to catch your flight from the Venice airport, catching a land taxi is a good way to go. It's easy to locate a taxi stand inside the Stazione Marittima cruise terminal - it is on the side of terminal buildings #107/108. The only problem is... if your ship has turnaround on the same day as another two or three ships... Venice port will be full of people trying to do the same: catching a taxi to Venice airport. So, be ready to wait in line. Actually, standing in line cannot guarantee you will get the taxi first. Taxis, as they arrive, do not stop in any particular line or order. As there is no-one there to keep the line in order and make taxis take the first in line, expect people to simply jump out of the line and catch the taxi that stopped in front of them. I know, a bit frustrating, so arm yourself with alot of patience or be prepared to let the Italian in you out! Taxi rate from Venice cruise terminal to airport in a Venice land taxi will cost you €30 - €40. Depending on traffic it can take from 20-30 minutes. Unfortunately such a thing does not exist. If you are visiting Venice for a day or two as part of your Europe cruise itinerary and want to get downtown Venice or to San Marco, you'll need to look into other means of transportation. 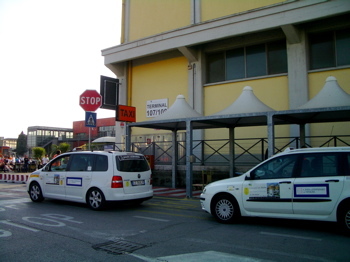 Taxis (land) will be available inside the Stazione Marittima terminal mostly only on turnaround days. Even if the day of your cruise ship's visit coincides with other ship's turnaround and taxis are available inside the Stazione Marittima, taxi drivers will always rather take passengers to the airport than to Piazzale Roma which is only a 5 minute ride away. So, if you decide not to take cruise ship organized transportation to Venice and want to take a vaporetto down the Grand Canal, walking to Piazzale Roma will be your only option. As Piazzale Roma is a big Venice transportation hub, it will be very easy to catch a land taxi from there to the Stazione Marittima or San Basilio cruise terminal. Stazione Marittima cruise terminal is only a few minutes ride from the Piazzale Roma but expect to pay about €15 and there is a few euro charge for big luggage. If you don't want to pay more for that few minute ride than you paid for the local bus from the airport to Piazzale Roma, and you are fit and healthy, you might consider walking to the Stazione Marittima cruise terminal.